"Be especially careful when topping up the fluid in a battery, Hydrogen and Oxygen may be released the minute you unscrew the top. Hydrogen is explosive in just a 4% mixture with Air. Before topping up a battery, turn off the 12v power and EHU, ensure the battery is not being charged. Don't forget Solar charging. Pull the isolation fuse between the Solar Panel and the Regulator. DO NOT PULL ANY FUSES BETWEEN THE SOLAR REGULATOR AND THE BATTERY. See our Solar pages for WHY. Ideally top up the battery only after it has been standing unused/uncharged for a day or two. Take great care not to make Sparks, by undoing/re-attaching a battery clamp during/after the Top Up process. Ventilate the area well before starting the Check/Top-Up procedure. Ensure the battery is a wet battery, some AGM batteries have seemingly removable caps which should never be removed. If it is a Wet Acid battery meant to have maintenance, undo the Battery Caps. If the battery does not have battery caps then it is probably not meant to be topped up so seek advice. Shine a torch down into the Battery and check the electrolyte is at least covering the Plates. Some batteries have min/max marks which should be used, if available. If the Plates are visible it is likely the battery has suffered damage. Note exactly how much water you need to add as this will be a guide to how often you need to check the battery, but also a guide to the likely damage if the Plates were visible. If you need to add significant water to cover the Plates, we would suggest you consider battery replacement. At the very least, monitor the battery carefully and check it more regularly. Also monitor the charging voltages of all the charging systems, Alternator, Mains, Solar, etc to ensure they are all within specification. During the 'topping-up', Hydrogen and Oxygen gas will have almost certainly been released so ventilate the area really well and ensure no Sparks are created for some time after to reduce the risk of explosion. A less common form of battery explosion occurs when the battery is subjected to high temperatures while charging causing thermal runway in AGM or Gel batteries. Should a battery explosion occur and battery electrolyte (battery acid) gets in the eyes, flush with any drinkable liquid immediately because SECONDS count, continue flushing with water for at least 15 minutes, and seek immediate medical attention. In addition, neutralise residual battery acid, by thoroughly washing the area with a solution of one-pound baking soda (bicarbonate of soda) to one gallon of warm water and rinse thoroughly with water". Better still be extra safe and only use an Absolutely Maintenance free battery that does not need topping up. There are now modern batteries that don't loose fluid and don't need topping up, The new exceptional Yuasa L36-EFB is quoted as having ZERO fluid loss. Also checkout the Bosch L5/Varta LFD range. 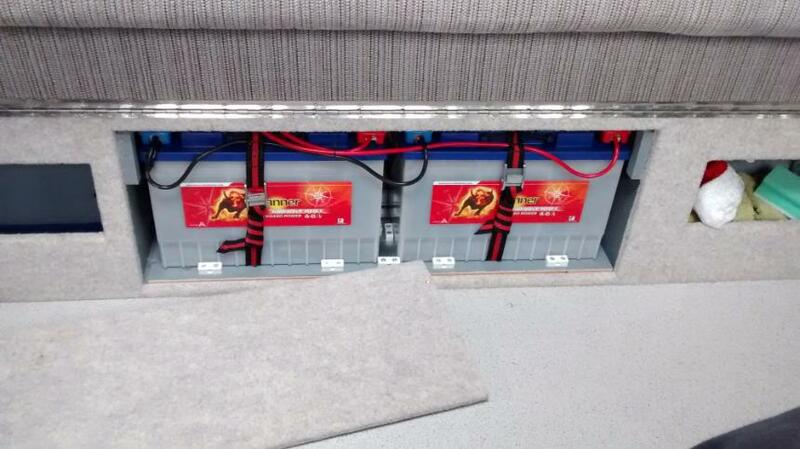 Gel batteries have low fluid loss but are very slow to charge up and suffer other compromises that make them unsuitable for modern motorhomes and caravans. The batteries in the installation above took 30 minutes to remove, top-up and put back in place. The 11 month old batteries took almost a litre of Water each. The Motorhome Converter, one we think delivers a real quality product, had been told by the battery supplier they were zero maintenance batteries. Bailey also fitted them in their vehicles for a while as 'maintenenance free' because of the same incorrect advice. Banner Energy Bull batteries are one of the highest maintenance Leisure batteries going, so bearing in mind the safety issues above, are unsuitable for use in a Motorhome.